Each month the MLC releases a collection of monument fonts/design resources at a special promotional rate. Don’t miss out, check back each month for a new deal! ‘FINAL DATE FONTS PACK: 6 fonts for only $195! Spring is here, which means its time to start cutting final dates again This months special is a starter pack of 6 fonts for matching cemetery inscriptions. MLC Modfied Roman SR – The original Modified Roman created by the Spacerite Company. MLC Modfied Roman SR Handcut – The Spacerite Modified Roman with two versions of modified serifs to mimic hand-cut clipped serifs. MLC Condensed Roman SR – The original Condensed Roman created by the Spacerite Company. MLC Condensed Roman SR Handcut – The Spacerite Condensed Roman with two versions of modified serifs to mimic hand-cut clipped serifs. MLC Modified Roman SKS – The ScotchKut version of Modified Roman, containing two versions to match all sizes of the plastic alphabets. 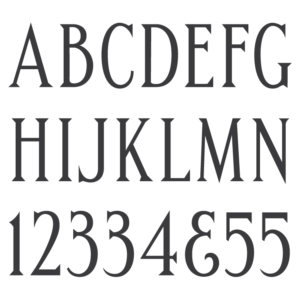 MLC Vermarco SR – The original Vermarco alphabet created by the Spacerite Company. * Only the basic character set is shown. For a full character map sample view the Font Project page. Alternate characters shown in grey.